Before I begin I should warn you, dear reader, that Ancillary Mercy is the last book in the Imperial Radch trilogy and what follows may contain spoilerishy things for the first two books in case you plan to read them! Ancillary Mercy takes up right where Ancillary Sword left off: Breq’s revelations leave her crew reeling with shock; there’s the question of the ghost gate and the mysterious occupants beyond it; Anaander Mianaai is still AWOL; and to complicate matters further a new Presger translator arrives on the scene, just a few pages into the book. The scene is set and everyone’s on tenterhooks! Ancillary Mercy is a fast paced, gripping read. And yet despite being a page-turner the thing that strikes me the most about this book, and in fact this trilogy as a whole, is its meditative quality. (Is there a category called ‘meditative thriller?’ ‘Cus Ann Leckie would definitely belong there!) I think this is partly because of the way Leckie structures her story. Scenes of nail-biting action alternate with details of ordinary existence. You might be annihilated any second but till that happens you still need to eat and you still need to—pardon my crudeness—poop. It’s this juxtaposition of extremities that often brings what matters into a startling focus. Against the background of an uncertain intergalactic war, Leckie explores the invisible nature of privilege. While Seivarden’s character makes the “peculiar benefits” of privilege pretty obvious, Breq’s realizations sneak up on her and the reader. That this happens to wise, omniscient Breq who sees to the heart of the matter is a masterstroke on Leckie’s part. It really brings home how easy it is to overlook one’s own position of privilege and the power imbalances that can result in one’s relationships because of this. All this doesn’t take into account the details that make the Imperial Radch world feel so alive. My particular favorite is the layers of meaning that Leckie vests glove-wearing with—in Leckie’s world not wearing gloves would cause greater mortification than being naked. I’ve never really thought about the things that we take for granted as social mores but this trilogy has made me wonder at their arbitrariness and how the very same thing that causes ridicule in one culture might be valued in another. Then there is the gentle menace of the Presgers who are unable to distinguish one human from another. The translator in particular often provides comic relief accompanied by a swift feeling of disorientation in the scenes where she (he? it?) is present. The question of what it means to be human—Is it having a body? Feelings? Awareness of oneself and one’s surroundings? Consciousness? Sentience? All of the above? A combination of some?—crops up again and again through the course of the story (and the trilogy) and is central to resolving one of the conflicts in the book. This resolution might come across as gimmicky to some readers but it seemed like a logical next step in the story that Leckie has been telling. “But it’s a fish.” Her expression was frankly perplexed. “Aren’t fish for eating?” The district magistrate stood at the top of the steps into the courtyard, staring at the translator. 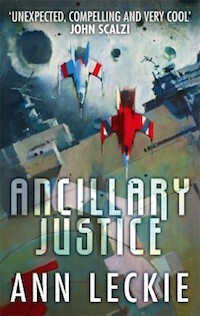 Ancillary Sword is the sequel to Ann Leckie’s Ancillary Justice which swept up just about every sci-fi literary award possible last year. I’d read Ancillary Justice last fall and finished Sword a few days ago. What follows may contain key spoilers for the first book (and also the show Battlestar Galactica)—so, you’ve been warned! When I’d first read Ancillary Justice I was struck by how its description of AI resembles the Cylons of Battlestar Galactica. For those of you who don’t know about BSG, Battlestar Galactica is a highly acclaimed sci-fi series that ran from 2004 to 2009. It’s ending is easily one of the best.est. EVER. I glommed on to it big time. In BSG, there are several “clones” aka cylons—robots with AI who look human and are identical to each other and who exist in groups. So there are copies of Number One (a group of the humanoid cylon), copies of Number Two (another group of the humanoid cylon) and so on. In the Ancillary world there are several bodies of the same one mind. This hive-mind is often a spaceship which is crewed by humans and also “ancillaries” who are the ship’s AI fed into dead human bodies. There are groups of ancillaries, with about 10 ancillaries to a group. These ancillaries serve the human crew and act as the ship’s eyes, present as they are in several places at once. The set-up in both the cases lends itself to contemplating issues of identity and also meditation on what it means to be a human being. In Battlestar Galactica the question of identity is explored through two of the Cylons specifically: one of the Sixes who was instrumental in the destruction of the entire human race save a few thousand, and in an ironic turn of events one of the Eights who, as she falls in love with a human (I promise it is not as sappy as it sounds) and who in turn falls in love with her, sort of becomes a template for the future of humanity (and it isn’t as trite or simple as I make it sound). These two cylons have to contend with thoughts and feelings that their counterparts do not experience. Then there’s the humans who cannot get their head around the concept that Cylons, a creation of humans after all, could be anything remotely close to what a human being is. In the Ancillary world Breq, our heroine/hero (I’ll get to the hero/heroine part later), is one of the ancillaries of the ship “Justice of Toren.” “Justice of Toren” is completely destroyed in the first book, save the one instance of Breq herself/himself. One of the defining characteristics of this particular manifestation of the “Justice of Toren” is that she/he loves music. It seems like such a trivial aspect to endow on a character and yet it serves to bring the whole issue of identity into a tighter focus. The destruction itself of all of it save herself/himself leads Breq over and over to contrasting and often interesting turns—the destruction of the wholeness of who she was feels incapacitating to her and yet without that destruction she could not have become one who has any sort of agency. This is perhaps more the theme of the first book than the second. Ancillary Sword is more concerned with exploring what it means to be a person with agency in the context of a civilized world and what being civilized means in the first place. Radchaii (the civilization in which Leckie’s stories are set) have been annexing planets for thousands of years and they justify their invasions as their version of the “white man’s burden.” The absorption includes allowing the ruling classes of the conquered societies to continue with the rituals and traditions that are important to them. For maximum benefit, the Radchaii are focused on maintaining the status quo in the worlds they take over as this allows for the minimal of upheavals in the existing power factions. This is not to say that it’s not clear who the conquering hero is—it is. It’s just that the Radchaii have become really good at appeasing the worlds they stride into (to the extent that there are factions of the conquered who believe that justice would be theirs if only there was a way of getting Anaander Minaai’s (the Lord of the Radch’s) attention). As to what it means to be a citizen of the civilized world, one of my favourite aspects about Leckie’s story-telling is her ability to show clearly the prejudices that inform the biases of many of the power differentials at work in her world. It’s insidious and just like real life the people of the Ancillary world aren’t even aware of them. The only one who seems to be clear-sighted is Breq. Given that Breq is after all thousands of years old AI I can find this prescience believable (mostly). However that didn’t stop her from being a little insufferable at times. I was also struck by how the second book is called Ancillary Sword and not Ancillary Mercy given that the ship that Breq commands from page 1 of the second book is “Mercy of Kalr” and not “Sword of Atagaris” (another major ship/player in the book). Well it’s not that surprising given how the events unfold but it made me even more aware of one of the major threads that runs through the book: of what it means to be a conscious being. The humans in Leckie’s world find it alien that ships who are just AIs would have preferences or feelings. Breq addresses this in a line in the book which I of course cannot find now! She talks about how humans are unable to recognize that thoughts and feelings are tangled up in one another and are not as unconnected as one would tend to think. As someone who’s come to see that emotion follows in the wake of what I’m thinking, I found this parsing to be spot-on. I cannot wait to see “Mercy of Kalr” taking the front stage in the third and the final book!